Khaled completed Master of Science in Computer Science from the Department of Mathematics and Computer Science, University of Lethbridge, AB, Canada. 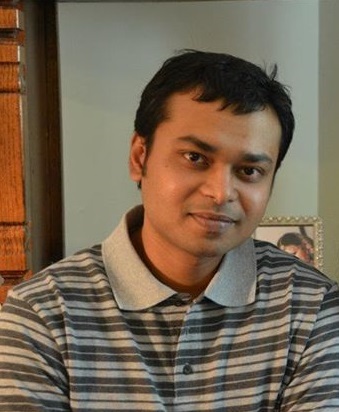 Earlier Khaled completed his undergraduate from the Department of Computer Science & Engineering from the University of Dhaka, Bangladesh. He also earned his master's degree from the same department. Apart from the private university teaching that he did in later stages of his masters at DU, Khaled actually started his career at World Bank in 2007, later moved to LM Ericsson in the same year. Khaled joined the Institute of Information Technology, University of Dhaka in August 25, 2008 as a Lecturer. He was promoted to the position of Assistant Professor in June 03, 2013 and to Associate Professor on February 27, 2018. Khaled has also served IIT DU in the capacity of Student Adviser during 2012 to 2015. Md. Samsuddoha, "An Empirical Approach to Validate Heuristic Algorithms for Procedural Programming to Object Oriented Design Migration", Accepted for awarding B.Sc. in Software Engineering Degree at the Institute of Information Technology, University of Dhaka, 2014. Mirza Rehenuma Tabassum, “A Comparative Study of Digital Watermarking Techniques on Still Images” Accepted for awarding B.Sc. in Software Engineering Degree at the Institute of Information Technology, University of Dhaka, 2012. 1. Co-authored “Uchha Maddhamik Computer Shiksha Prothom Potro (Computer Education for Higher Secondary Level Part -1)” in Bangla, published by The Royal Scientific Publications, 42/1 Purana Paltan, Dhaka-1000, Bangladesh. (Other authors: Prof. Abul L Haq, M L K Sadi, M. Abedin, S Saha; 422 pages). 2. Co-authored “Uchha Maddhamik Computer Shiksha Dwitio Potro (Computer Education for Higher Secondary Level Part -2)” in Bangla, to be published by The Royal Scientific Publications, 42/1 Purana Paltan, Dhaka-1000, Bangladesh. (Other authors: Prof. Abul L Haq, M L K Sadi, M. Abedin, S Saha; around 400 pages). 1. Shanto Rahman, Md. Mostafijur Rahman, Khalid Hussain, Shah Mostafa Khaled and Mohammad Shoyaib, "Image Enhancement: A Comprehensive Study", 17th International Conference on Computer and Information Technology (ICCIT 2014), Dhaka, Bangladesh. 3. Rubaida Easmin, Shamira Tabrejee, Lamisha Rowshon, Alim Ul Gias, Md. Miraj Kobad Chowdhury and Shah Mostafa Khaled, "In Silico Analysis of Salt Responsive Survival Associated Motifs in Rice Promoter", The 8th International Conference on Software, Knowledge, Information Management and Applications (SKIMA 2014). 4. Khalid Hussain, Shanto Rahman, Shah Mostafa Khaled, Mohammad Abdullah-Al-Wadud and Mohammad Shoyaib, "Dark Image Enhancement by Locally Transformed Histogram", The 8th International Conference on Software, Knowledge, Information Management and Applications (SKIMA 2014). 5. Rumana Ferdousi Siddique, Asheek Mohammad Shimul, Alim Ul GIas, Mohyeminul Islam, Shah Mostafa Khaled, “The Role of Episodic Buffer in Episodic Future Thinking”, Mental Health Gap in Bangladesh: Resources and Response, 4th Bangladesh Clinical Psychology Conference, August 19-22, 2014, Dhaka, Bangladesh. 6. Mirza Rehenuma Tabassum, Md. Saeed Siddik, Mohammad Shoyaib, Shah Mostafa Khaled, “Determining Interdependency Among Non-functional Requirements to Reduce Conflict”, 3rd International Conference Informatics, Electronics & Vision 2014, Dhaka, Bangladesh. 7. Mohammad Ibrahim, Md. Iftekharul Alam Efat, Shah Mostafa Khaled, Mohammad Shoyaib, “Face Verification with Fully Dynamic Size Blocks based on Landmark Detection”, 3rd International Conference Informatics, Electronics & Vision 2014, Dhaka, Bangladesh. IEEE Xplore Best Presentation Award. 8. Md. Saeed Siddik, Alim Ul Gias, Md. Selim, Shah Mostafa Khaled, Kazi Sakib, “A Direction of Migrating Procedural Paradigm to Object Based Architecture by forming Cluster of Functions using Local Search Heuristics”, 3rd International Conference Informatics, Electronics & Vision 2014, Dhaka, Bangladesh. 9. Rubaida Easmin, Alim Ul Gias, Shah Mostafa Khaled, “A Partial Order Assimilation Approach for Software Requirements Prioritization”, 3rd International Conference Informatics, Electronics & Vision 2014, Dhaka, Bangladesh. 10. Jobaer Islam Khan, Alim Ul Gias, Md. Saeed Siddik, Md. Habibur Rahman, Shah Mostafa Khaled, Mohammad Shoyaib, “An Attribute Selection Process for Software Defect Prediction”, 3rd International Conference Informatics, Electronics & Vision 2014, Dhaka, Bangladesh. 11. Md. Iftekharul Alam Efat, Md. Saeed Siddik, Mohammad Shoyaib, Shah Mostafa Khaled, “Feature Prioritization for Analyzing and Enhancing Software Reusability”, 3rd International Conference Informatics, Electronics & Vision 2014, Dhaka, Bangladesh. 12. Md. Selim, Md. Saeed Siddik, Alim Ul Gias, M. A. Wadud, and Shah Mostafa Khaled “A genetic algorithm for software design migration from structured to object oriented paradigm”, 8th International Conference on Computer Engineering and Application (CEA 2014), Tenerife, Spain, January 10-12, 2014, pp 187-192. 13. Mohammad Ibrahim, Md. Iftekharul Alam Efat, Humayun Kayesh Shamol, Shah Mostafa Khaled, Mohammad Shoyaib, M. Abdullah-Al-Wadud, “Dynamic Local Ternary Pattern for Face Recognition & Verification”, 8th International Conference on Computer Engineering and Applications (CEA '14), Tenerife, Spain, January 10-12, 2014, pp 146-151. 14. Md. Saeed Siddik, Alim-Ul-Gias, Shah Mostafa Khaled, “Optimizing Software Design Migration from Structured Programming to Object Oriented Paradigm”, 16th International Conference on Computer and Information Technology (ICCIT), 2013, Khulna, Bangladesh. pp 1-6. IEEE Xplore. Best Student Paper Award. 15. Shah Mostafa Khaled, Robert Benkoczi, Yuanzhu Peter Chen, “Mesh Network Deployment to Ensure Global Reachability”. 2012 Third FTRA International Conference on Mobile, Ubiquitous, and Intelligent Computing (MUSIC), Vancouver, Canada, 2012, pp. 207-213. 16. Md. Saiful Islam, Shah Mostafa Khaled, Khalid Farhan, Md. Abdur Rahman, Joy Rahman, “Modeling Spammer Behavior: Naïve Bayes vs. Artificial Neural Networks”, International Conference on Information and Multimedia Technology 2009 (ICIMT 2009), Jeju Island, South Korea, pp. 52-55. 17. Shah Mostafa Khaled, Ashis Kumer Biswas, Dr. M Lutfar Rahman, Dr. Suraya Pervin, “An Analysis on Human Resource Development in the ICT Sector of Bangladesh”, 8th International Conference on Computer and Information Technology (ICCIT), 2005, Dhaka. pp 507-512. 18. Shah Mostafa Khaled, Ashis Kumer Biswas, Md. Akhtaruzzaman, Md. Lutfar Rahman, "Present Status of Telecommunication in Bangladesh and its Impact on ICT", 9th International Conference on Computer and Information Technology 2006. pp 221-226. 19. Shah Mostafa Khaled, Md. Rezaul Karim, “A Proposed Low-cost Security System Based on Embedded Internet Control”, SICE-ICASE International Joint Conference 2006, Busan, Korea. pp 4306-4311. 20. Md. Asif Hossain Khan, Sumanta Saha, Shah Mostafa Khaled, Md. Tohidul Islam, Md. Sanaul Karim, “A Novel Approach to Extend SMS Capability of Mobiles to Emailing capability”, 8th International Conference on Computer and Information Technology (ICCIT), 2005, Dhaka. pp 864-868. 21. Shah Mostafa Khaled, Md. Atiqur R. Ahad, Dr. Hafiz. Md. H. Babu, “An In Depth Analysis on e-Governance, Its Challenges and Prospect in Bangladesh”, Proceedings of Annual Convention 2005 of Bangladesh Computer Samity, Dhaka. pp 53-60. 1. Md. Habibur Rahman, Sadia Sharmin, Sheikh Muhammad Sarwar, Shah Mostafa Khaled, Mohammad Shoyaib, "Software defect prediction using minimized attributes", Journal of Engineering and Technology (JETIUT), Islamic University of Technology, Gazipur, Dhaka, Accepted. 2. Rumana Ferdousi Siddique, Asheek Mohammad Shimul, Alim Ul Gias, Mohayeminul Islam, Shah Mostafa Khaled, "The Role of Episodic Buffer in Episodic Future Thinking", Universal Journal of Psychology. Vol. 3, No.1, 2015, pp.1-8. 3. Mohammad Ibrahim, Tajkia Rahman Toma, Md. Iftekharul Alam, Shah Mostafa Khaled, Md. Shariful Islam, Mohammad Shoyaib, "Dynamic Blocks for Face Verification", International Journal of Computer Vision & Signal Processing (IJCVSP), Accepted. 4. Md. Iftekharul Alam, Mohammad Ibrahim, Humayun Kayesh, Shah Mostafa Khaled, Muhammad Mahbub Alam, Mohammad Shoyaib, “Vision Inspired Adaptive Local Ternary Pattern for Face Recognition and Verification”, Journal of Engineering and Technology (JETIUT), Islamic University of Technology, Gazipur, Dhaka. 2013. Vol. 11, December 2013, pp 51-66. 5. Shah Mostafa khaled, Alim-Ul-Gias, Amit Seal, Md. Hasanuzzaman, “Face Recognition and Adaptation for Secure Human Computer Interaction”, International Journal of Advanced Computer Science (IJACS), Vol. 3, No. 10, 2013, pp. 512-529. 6. Mirza Rehenuma Tabassum, Alim Ul Gias, Md. Mostafa Kamal, Hossain Muhammad Muctadir, Asif Khan Shakir, Asif Imran, Saiful Islam, Md. Golam Rabbani, Shah Mostafa Khaled, Md. Saiful Islam, Dr. Zerina Begum, "Comparative Study of Statistical Skin Detection Algorithms for Sub-Continental Human Images", Information Technology Journal (ITJ), Vol. 9, 2010, pp811-817. 7. Shah Mostafa Khaled, Md. Saiful Islam, Md. Golam Rabbani, Mirza Rehenuma Tabassum, Alim Ul Gias, Md. Mostafa Kamal, Hossain Muhammad Muctadir, Asif Khan Shakir, Asif Imran, Saiful Islam, "Combinatorial Color Space Models for Skin Detection in Sub-Continental Human Images", Lecture Notes on Computer Science (Springer-Verlag) 5857, pp. 532-542, 2009. 8. Md. Kamrul Abedin Tarafder, Shah Mostafa Khaled, Mohammad Ashraful Islam, Khandakar Rafiqual Islam, Hasnain Feroze, Md. Khalaquzzaman, Abu Ahmed Ferdaus, "Reverse Apriori Algorithm for Frequent Pattern Mining", Asian Journal of Information Technology, Vol. 7, No. 12, 2008, pp. 524-530. 9. Shah Mostafa Khaled, Rezaul Karim, Ashis Kumer Biswas, R.H. Rahman, Nusrat Nowsheen and Mohammad Abdul Qayum, "Optimization of Reliability in a Real Time Security System Controlled by Embedded Internet Technology", Asian Journal of Information Technology, Vol. 6, No. 10, 2007, pp. 1050-1056. 10. Md. Asif Hossain Khan, Sumanta Saha, Shah Mostafa Khaled, Md. Tohidul Islam, Md. Sanaul Karim, "Extending Mobile Phone SMS Capability into Email", Dhaka University Journal of Science, Vol. 55, No. 2, July 2007, pp 167-170. 11. Md. Minhajul Abedin, Roksana Akter, Md. Rashedul Bari, and Shah Mostafa Khaled, "A Low Cost, Effective Leader Election Algorithm Based on AODV", Journal of Computer Science, Vol. 1, No. 2, Dec 2007, pp 45-52. 1. Shah Mostafa Khaled, “Heuristic Algorithms for Wireless Mesh Network Planning”, Department of Mathematics and Computer Science, University of Lethbridge, Canada, Supervisor: Dr. Robert Benkoczi. 131 pages, August 2012. 2. Shah Mostafa Khaled, “Face Recognition and Adaptation for Human Computer Interaction”, Department of Computer Science and Engineering, University of Dhaka, Supervisor: Dr. Md. Hasanuzzaman. 85 pages, 2007.